What makes a good stabilizer? To answer that question, one must understand what a stabilizer is for. Ideally, archery stabilizers stabilize or balance the launching platform on which an archer rests their arrow for firing: your shooting apparatus -- your bow and all its accessories. Today, due to the high speeds and power attainable with the modern bow and bow accessories, stabilizers have become a necessity for pros. But what if there was another completely different issue that stabilizers could help with? Simply put, as most readers already know, stabilizers literally counteract the weight of anything on your bow that makes its weight unbalanced in your hand. The easiest way to discover what type of stabilizer or what weight(s) you need to add to your bow is by using a bow balancer. Put a stabilizer on your bow, let it sit on the balancer. If it tips in one direction, add some weight and/or length to the other side, etc. This process itself has some issues and we'll get to them later, but it's important to get to a new issue we uncovered. As aforementioned, a lot of shock and aftershock return to your bow after firing. Note "return." Why does anything have to return? Energy. In physics, Newton's third law states all forces between two objects exist in equal magnitude and opposite direction. Therefore, via this law, all the force, and energy exploited during pullback and aiming return "in [the] opposite direction" -- to your bow. And thus how does that force and energy come to play? Vibration and shock. So. As we've already covered, standard stabilizers already balance your bow. The distinction that must be made, however, is that they only do half of what is truly necessary. While they can be used to counteract the weight of all the different types of accessories available today, they do not also counteract that vibrational energy output from high-performance bows. Made of aluminum or carbon, a standard stabilizer bar is not capable of doing the job of negating all that force. But what can? Our answer, titanium. (US Patent # 9,909,833) Or more specifically, GR5 and GR9 titanium. Additionally lightweight and strong, the main reason why titanium is the perfect material for use is its rigidity and resistance to vibration. See, instead of all that energy passing along your extension bar to its weight and back, that energy will meet the titanium (particularly GR9, which specially designed for use today in applications like ultra-high pressure oil pipes) and be consumed immediately, never allowed to return back to your bow. For extra insurance, all connection studs are made of GR5 titanium to further minimize the transfer of vibration from one media to the next. If we had one sentence to explain why the AeroStab was so unique, the forthcoming sentence would be it. Completely interchangeable and able to counteract both the weight and vibrational output of your bow, this series still weighs up to 80% lighter and costs can be cheaper than what is on the market. To get to a specific page on our web store, click the image. Unlike traditional stabilizer systems which offer pieces and connections of all sizes and all shapes, every piece of the Firenock AeroStab Series is based around the main connection pieces. Including a bow mount, a front connection mount, an angled front mount as well as multiple elbow and couplers, the possibilities are endless. But, of course, a stabilizer involves more than just connection pieces. Currently, this series also involves multiple length extension bars and weights all are able to mate to the connection pieces, thus making them completely interchangeable and infinitely adjustable. "Counteract Both Weight and Vibration Output"
Though the AeroStab's ability to consume the vibration output of a bow was already heavily discussed above in "The Theory," the weight stabilizing facility involved was only briefly mentioned. So we'll do so better now. Mechanically, the most commonly used device for stabilizing the weight of a bow is a bow balancer. This tool is what we intend consumers to use to balance the weight output of their bows. There is a common problem that occurs during that process, however: the capacity to make precision adjustments. While other stabilizer mounts involve simple connections like teeth or dimples, each of our connection pieces have a special O-ring that allows for precise, controlled adjustments at multiple angles (US patents pending). Further, with the use of numerous connection pieces, there is an option for compound angles, for even more precise adjustments. But the key lies in how to mate all and any of these pieces together. Currently, there are two methods of tightening. 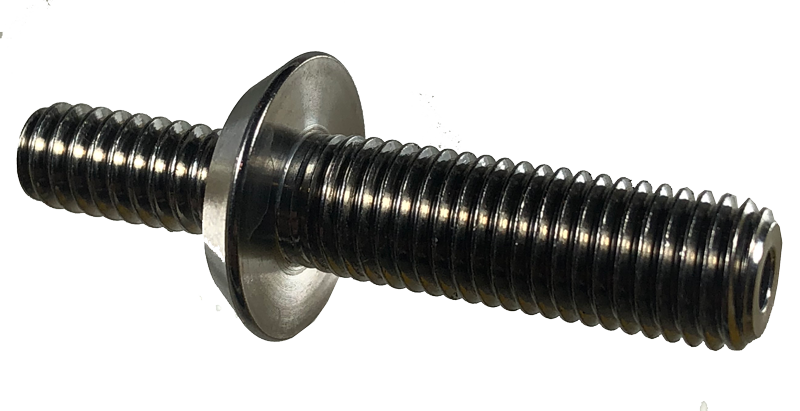 For most connection parts, there is a specially made hollow GR5 titanium button head screw (5/16"-24 x 3/8"; OD of 0.5") that can be torque tightened with a T40 driver. Also, the same size as the screw used on most stabilizers, due to its material, this fastener weights 80% less. 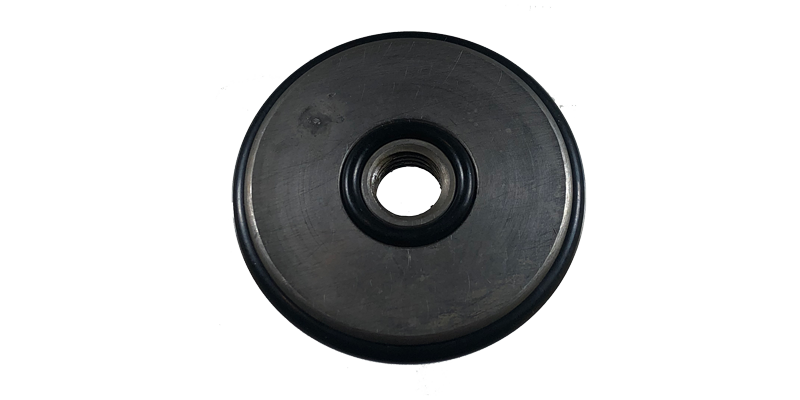 When even more torque is necessary, we also provide GR2 titanium washers (ASTTIW) for adding to the button head screw's shoulder (40% increase). Additionally, for the coupler connections that need to be tightened upon, two 12mm slots are machined on their barrels so a wrench can be used. A standard Hunter Class stabilizer system with a 6" sidebar and a 12" front bar can be as heavy as 22 oz. Of those 22 ounces, only four are the actual weight for weight stabilization. The rest is just the extension bars and elbows to position the weights. 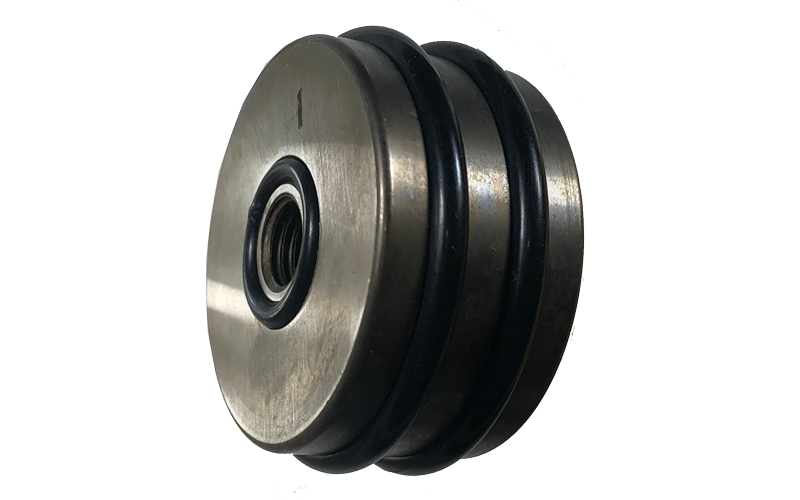 On the other hand, replicating the exact configuration of one short and one long extension bar, all AeroStab pieces besides the weight will weigh less than 5 ounces. And, the best part of it all, due to the simplicity of the system -- every piece is maximum only machined and then laser-marked -- the entire system can go for cheaper (depending on how you configure your setup). Do not let that "simplicity" fool you, howbeit. As with all things proudly from the Firenock lineup, from Dorge's mouth, "everything that could be considered has been considered".